January 4th is here at last! To be honest, I don't think I enjoyed taking such a long break from the comics. Well, I enjoyed it, but I didn't enjoy it, you know? I don't know if I'll take such a long holiday break next year. If you missed it, I did do a long-winded "Year in Review" post on New Year's Eve. Scroll down to see that. Foothill-Anderson Library in Salt Lake City, Saturday, January 9, at 2 pm. Shannon and Dean will be there, I'll be doing a special presentation on the creation of the CALAMITY JACK illustrations--it should be very exciting. This is one of those few times you can get the ultra-rare TRIPLE SIGNED copy of Rapunzel and/or Calamity Jack. Okay, back in the webcomicking saddle! Feels good! 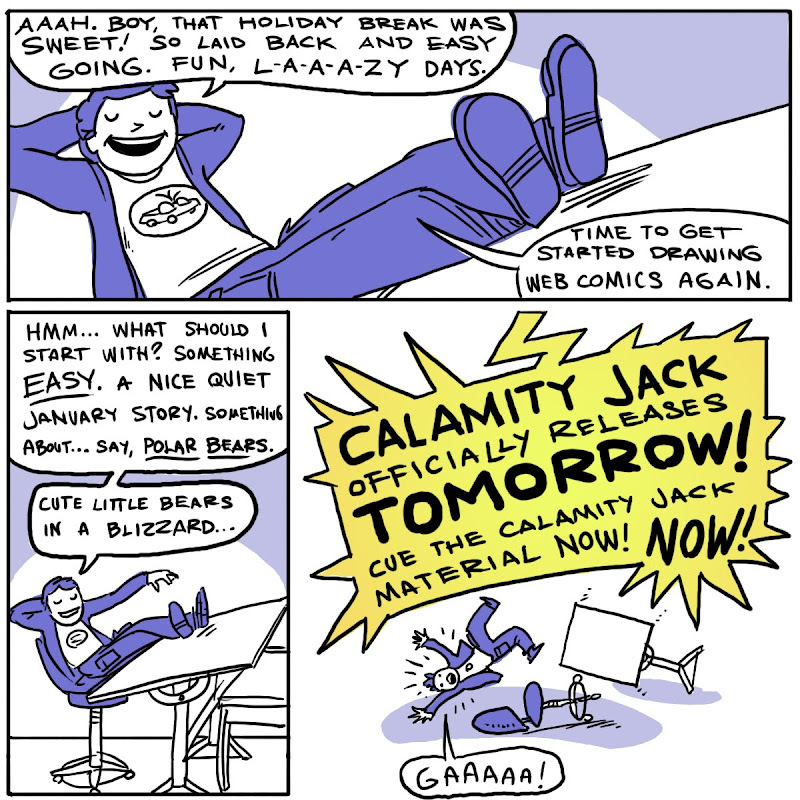 The CALAMITY JACK material starts tomorrow! Yay! Time to spendy spendy! I'll be there for Calamity Jack! ...but I hope the polar bears don't get ignored for too long. A good blizzard could be fun. Selfish Utah people...always having the parties in your own state. I want to hear a polar bear story big voice!! I preordered it and can't wait to see it. Just bummed it won't be signed. Do you think you could swing by Hawaii and do that for me?